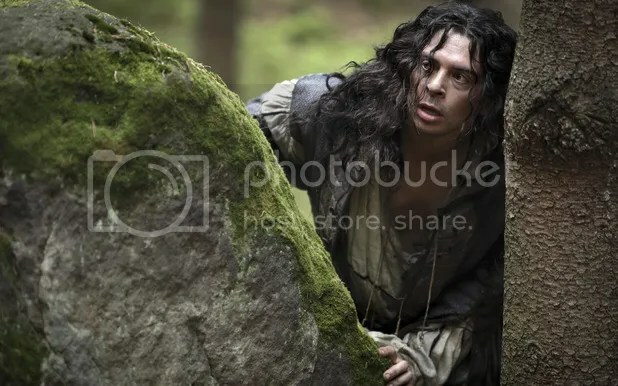 In the second episode the King decides that he wants to live like common people do so goes out on a night with the Musketeers and tries to pretend that he is a normal person with varying results and ends up starting a fight in a tavern and ends up being let out of the back way of the tavern by the tavern keeper and D’artagnan, and then they both promptly get coshed on the back of the head and taken away. This doesn’t go down well with the Queen who promptly blames the Captain for the King going missing. Constance does her best for the musketeers cause saying that D’artagnan would bring him back safely to which Rochefort retorts that as D’artagan is also missing then he too must have something to do with the Kings disappearance also which is a sense you can also not argue with either but don’t want Rochefort to get one up on the either the Queen or Constance herself. Unfortunately this falls right into Rochefort’s hands with the King being missing and the baptism of the Dauphin coming up very shortly. The Musketeers started out at the beginning and had to beat a confession out of the tavern keeper into what had happened to D’artagnan and the King. It turns out that they are about to be sold to a Spanish galley ship but none of the people have the slightest idea that Louis is the King and he ends up learning what the people really think about him. We also see Milady again who seems to be working with the smuggler but she soon double crosses him and inveigles her way into the King’s good books by pretending to rescue them and then pretending that she is just a mere woman who needs protecting, which is something that she definitely is not, but the king buys it hook line and sinker which is exactly what she hopes he will do. There is a lot going on in this episode what with the reintroduction of Milady and her new obsession with the King, Rochefort’s plan to seduce the Queen, and also, his attempt to try and make an alliance with Spain the moment he believes that the King might be dead and Louis new found virility and backbone. Marc Warren continues to ham his way through this series with the most bizarre accent that I have ever heard. I am really not too sure what sort of accent he is employing here as none of the other French people in this series are putting on a strange sounding accent as he is. Perhaps there will be a point to it in later episodes but I will not be holding my breath for such an explanation. Ryan Gage is also enjoying a lot more screen time, especially in this episode and he really does make you both feel sorry for the King and also want to punch smack in the kisser for being an ungrateful sod. He really is coming to his own in this series and is obviously having a ball playing the part.